Welcome to the May 2013 THHN Newsletter, as usual, it’s all go at THHN and our newsletters are the ideal way to keep up to date with everything that’s happened, as well as see what events we’ve got lined up in the coming weeks. Thank you for your interest in THHN and if you know of anyone who might like to read our newsletter please feel free to spread the word. In the meantime, good luck to the 5 Peaks team who start their three day challenge on 5th May. We’re thinking of you and wish you all the best. 9 year old Danielle and her lovely mum Sarah have taken on yet more work for the THHN. Many of you will know that Danielle has been making and selling her beautiful jewellery for us for quite a while. She is a great supporter of THHN and we are very proud of her, as are her parents and her headmistress who is very supportive of the great fundraising and awareness-raising work that Danielle does for us. Danielle and Sarah are also in charge of our new collecting tins. So, if you know of anyone who might be able to have a tin they’re the people to tell. Contact them by e-mailing s.moore@thhn.co.uk. As if that wasn’t enough to keep them busy, they’re doing a spot of car-booting for us too. Lots of people have donated all sorts of things, including toys, and Danielle and Sarah are planning a car boot sale this summer to raise yet more money from the sale of all the generously donated goods but they need as many great things for sale as possible. Again, if you have anything that you think would be good for them to sell please get in touch. Brian volunteers for the THHN as our Fundraising Manager. Brian previously worked as a fundraising manager for a national charity and, when he left, he wanted to find a local charity that he could help in his spare time – and we’re delighted that he found us! Brian brings great experience to the team and has put in a huge amount of time and effort already. With the ambitious bungalow project that we have planned, fundraising is increasingly important to the future of the THHN and Brian is a vital part of that. As well as helping others with their fundraising he’s also taking on his own challenge this year and planning a 20 mile walk in South Devon. He’d love others to join him so get in touch by e-mailing brian@thhn.co.uk if you fancy taking part in this fundraising walk. Brian would also love to hear from any of you with your fundraising ideas for THHN, maybe you would like to put on your own event for THHN, Brian will be more than happy to guide you through putting you own event on and give you lots of tips to help make your event a huge success! 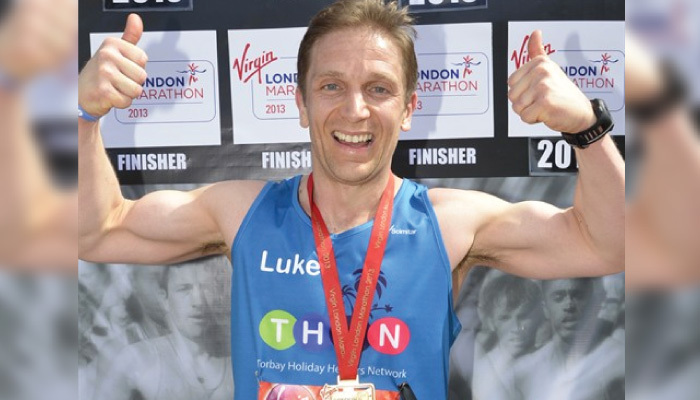 Talking of running, Luke started his trio of runs in style, completing the London Marathon in just 3 hours and 31 minutes – not bad! Next up is the 69 mile ultra marathon “The Wall” run in June. If you’d like to sponsor Luke please go to www.justgiving.com/Luke-Tillen The wonderful Linda Kelly from London also ran the Marathon to raise money for THHN and we can’t thank her enough. Not only did she run the course in 4 hours and 48 minutes, she also raised nearly £1000 via her Just Giving page. If their efforts have inspired you, we’re already looking for people to run next year’s London Marathon for us to help our Bungalow fund. Interested? Fancy doing something really amazing in 2014? The gang at Palm FM are still looking for some intrepid recruits for their Arctic Challenge next February, sponsored by Babbacombe Model Village. So, if you’d like to start 2014 with an experience of a lifetime go to www.palm.fm/p/whats-on/arctic-challenge-2014 for all the lowdown. June 5 – Pennywell Holiday Hike for info visit www.pennywellfarm.co.uk With special guest Peppa Pig this event is a “must” for all the little ones. October 13 – Great West Run. See above. The Ashley Court Hotel who gave a holiday to a family referred by Victim Support. Buckfast Abbey Self Catering who welcomed a THHN family this month. Hotel De La Mer who gave a holiday this month. The Morningside Hotel who welcomed a THHN family this month. Brunel Manor who provided another much-needed holiday for a family. Our fantastic food providers who this month include: Claire’s Cakes; Riverford Home Delivery; Luscombes Butchers; Halletts the Bakers; Over the Rainbow Cake Design; Total Produce Devon and D&H Fisheries. The Westbrook Hotel in Torquay who welcomed a family referred by Rainbows Hospice this month. The Torbay Tourism Association and the English Riviera Tourism Company who organised and hosted a great raffle for us at this year’s Tourism and Business Exhibition raising a wonderful £400. Pennon Group PLC who have sponsored the Hanbury’s Fish and Chips Music Festival to the tune of £100. This great event on 23 June is being put on to raise money for the THHN. Haddon Galleries for donating a great picture for us to auction via our Ebay store and which fetched £206. There are now loads of great THHN branded products that you can buy to not only help raise money for us but to help raise our profile too. Our t-shirts, polo shirts, running shirts and hooded sweatshirts are all available from our shop at www.thhn.co.uk/shop The t-shirts can also be purchased from all branches of Winners 2000 Fitness. And, ideal for fundraisers, we have some fab new wristbands – just £1.50 each or 7 for £10. You can pick them up from Hotel De La Mer or please send us a cheque and add 80p for all postal orders.